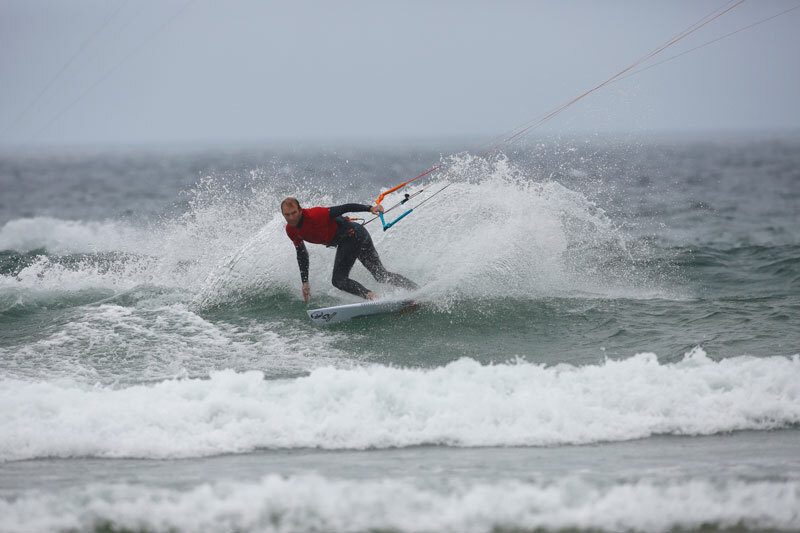 Wavemasters goes off and Pasty takes his sixth British National title! 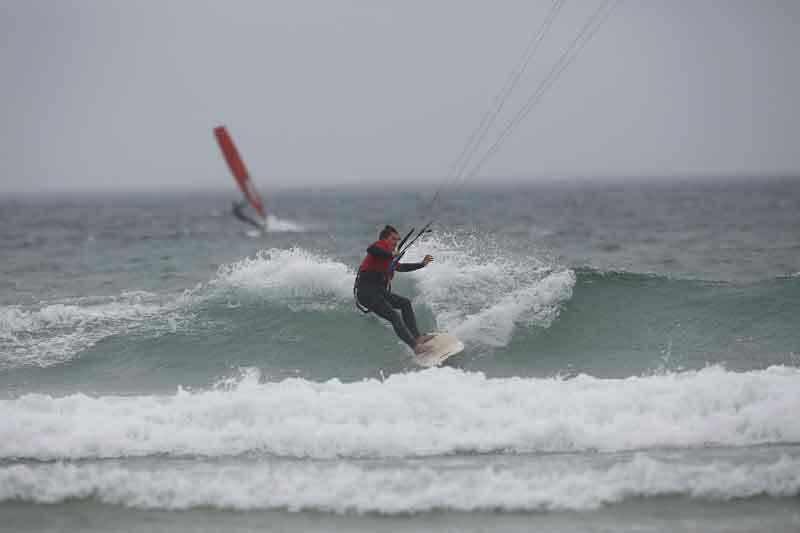 After what seems like most of the year without decent wind and waves, the forecast finally lit up for Gwithian for the first of the weekends scheduled for this year’s Wavemasters. Saturday morning arrived with the predicted blue skies and head high sets, welcoming a fantastic turnout of riders who’d made the drive west for the event. It was amazing to see the women’s numbers now equalling the pro men alongside amateurs, masters and a couple of juniors keen to go head to head (although maybe Adam Farrington would have preferred to be on a twin-tip!). The strong turnout of female competitors is a promising sign for British kitesurfing and the decision was made to offer equal prize money in light of that! The wind duly arrived in the afternoon, but never quite settled strong enough to guarantee staying upwind or getting back up through the contest zone! Tactical upwind running at the end of the wave saw more than one rider take advantage of the situation, but the waves kept coming. A couple of heats got black flagged and restarted when the wind got shiftier still, but the riders managed to crack through four of the five hours of heats needed before (just after the lifeguards packed up) both of the riders on the water finished their heat swimming in so the decision was made to call it a day! The Sunset Cafe knocked out a fine chilli to round out the day, but then it was early to bed as the forecast for Sunday was getting sketchy and the goal was to get some heats done before the tide came in! By pretty much first light on Sunday a surprisingly enthusiastic fleet were prepped and rigged on the beach. They finally had wind, but the waves were, let’s just say, not massive!! Gusty conditions made staying in the area tough, so out went the pro’s for their third round to show everyone how it’s done. 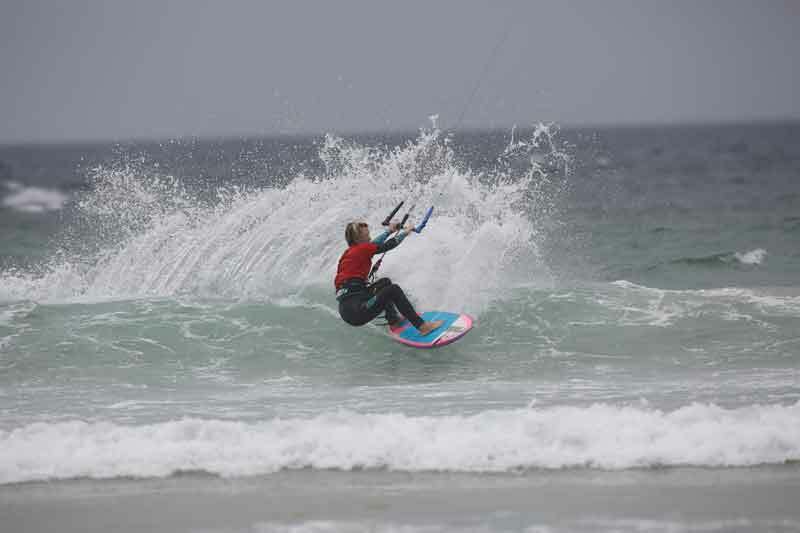 Wave selection became key at the narrow end of the comp, and reigning champ Lee ‘Pasty’ Harvey only just beat Alex Bird and Neal Gent (who this year managed to balance running the event with competing in it as well!) to make the winner’s final. In the second heat Mark Spencer did enough to book a final spot against Pasty, and Ben Clarke earned himself a chance at 3rd place against Alex. Mother nature refused to make the organisers’ lives any easier, as everyone then had to pack up again to vacate the beach under the cliffs before the tide cut them off from the goat track! She was much kinder later in the morning though, as forecasts of dropping wind were ignored and they finally had good 9m weather and some waves to bang out the finals! The Juniors and the Ams had been decided the previous day during which Mattia Miani showed some stylish riding to narrowly edge out Adam Farrington in both their heats and claim this year’s title in the juniors. In the Ams, Lance Olner left his foil at the top of the beach long enough to show off his riding prowess, taking the win ahead of Matt Bunn and Rob Morgan. Back to Sunday, and a hard fought Masters fleet came to a conclusion with local Neil Harper just seeing off Russ Farrington for the highly sought after title. Matt Saunders made the final in his first event, but his gamble on a bigger kite caught him out and left him struggling to match his earlier performances in the final. The Pro Women, after thinning down the largest entry to date, put on a show in the final. Suki Robertson proved she’s more than just a twin-tipper, with enough style and carving to just take the title from Jess Gent. Third was Francesca Miani who’d asked not to be in the juniors so that she could compete with the older riders! She’d been making the ladies all very nervous in earlier rounds, but was not quite able to find the waves to keep up her challenge in the final. In the Pro men the final saw Alex Bird take the last podium spot from Ben Clarke, and then in the title showdown Lee ‘Pasty’ Harvey showed his contest prowess again, making some ridiculous turns given the conditions, and somehow finding the best waves throughout the heat to give Mark Spencer too much to do in the second half of the heat. In doing so, Lee Harvey extended his run of national titles to six in a row! It was brilliant to see such a good turnout for the wave masters even with the limited forecast promised, and especially so to see how big the ladies fleet has become. Now rivalling the men’s fleet for entries, it was a simple decision for organisers to split the prize fund equally between the men’s and ladies fleet. Thanks again to Sunset Surf Cafe, as well as Duotone and Ozone for providing prizes. A massive thanks to the team, who were made to work super hard by mother nature to get the heat run in a very narrow window that included a 7 o’clock Sunday start! Thanks especially to Neil, Pete, Will (safety cover), Roy (flagman and heat runner extraordinaire!) and Lewis. Again the Wavemasters remained the friendliest, and best attended event on the calendar, and see you next year!